Customize your car with a wide range of paint, rims, brake calipers and interior trims, just as you would in real life with a world-class car configurator. Choose from paint wraps, decals, and custom license plates to personalize your ride. Car upgrades are only the start. You can now get under the hood to tune gear ratios, tire pressure, nitrous boost settings and much more. And when the competition gets ruthless, make sure you strip surplus cars for parts and fuse them into your favorite vehicles. 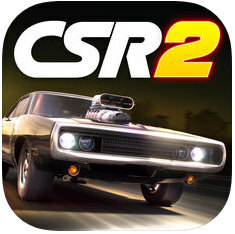 Collect the supercars of your dreams and show them off in your huge warehouse garage – CSR2 features over 200 officially licensed vehicles from the world’s most desirable car manufacturers including Ferrari, McLaren, Bugatti, Lamborghini, Pagani, and Koenigsegg.